We had agreed to start hiking at 8:00 this morning but I woke up early at 5:00. There was no need to get up yet so I stayed in my sleeping bag. Then I started hearing everyone else up and moving about and wondering aloud why I was still in my tent since I’m usually one of the first people up, so I got out. It was summit day so everyone was very excited, like kids on Christmas morning. I packed quickly and ate breakfast and then still had to wait for others to finish getting ready so I could have stayed in bed longer. We went and checked in at the ranger station before hiking. I am northbound thru hiker #779 this year but apparently not everyone knows to register there and get their number so it’s probably higher. We checked in again at the trailhead and started hiking at 8:30. 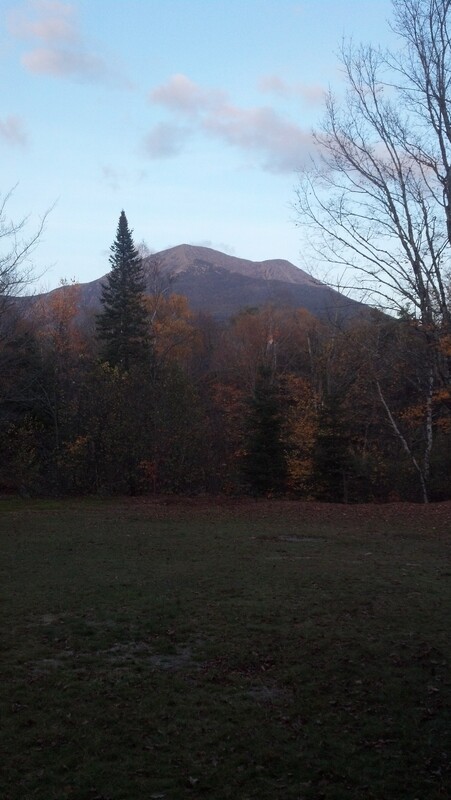 It was 5.1 miles and 4,172 feet of elevation gain to reach Baxter Peak on Mount Katahdin, the northern terminus of the Appalachian Trail. The first couple of miles were disarmingly easy. It was obviously steep but it was still a trail. 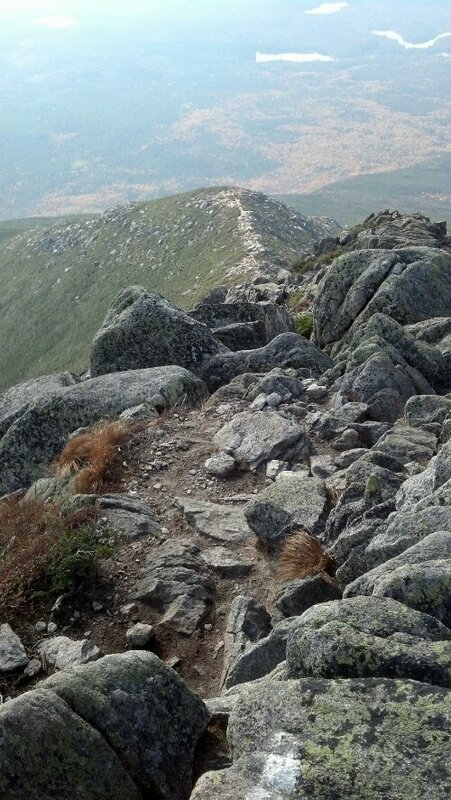 Then I got above treeline and it became more climb-like than trail-like. Usually when hard climbs are coming, exaggerated rumors about them spread down the trail, so when I get to said climb, it’s hard, but not as hard as anticipated. Somehow I hadn’t heard a single thing about this section though, and the unexpectedness of it made it seem more daunting. Suddenly there were giant boulders I needed to get over, with only a few pieces of rebar to help. I’ve done climbs like that before on the trail, and I did make it just fine, but there were a few small sections that I had to approach multiple times before finding a route I could actually get myself up. I was happy to be wearing my small slackpack instead of my regular large pack. I had my trekking poles still but they were pretty useless in the climbing sections and I had to keep throwing them up ahead of me to free my hands. I made it to the top of the false summit and entered the tableland, a level-ish but still rocky area. I had hiked above the clouds while I was still under treeline, but since I’d gotten above it, they were constantly moving in and out, so I’d be in fog for several minutes and then in sun for several minutes. The summit remained in clouds though so I never got a view of it until I was almost there. There were a few hikers ahead of me so I kept hearing everyone already up there cheering for them as they each got close to the summit sign. I made it to the last, brief climb, and could finally make out the sign. 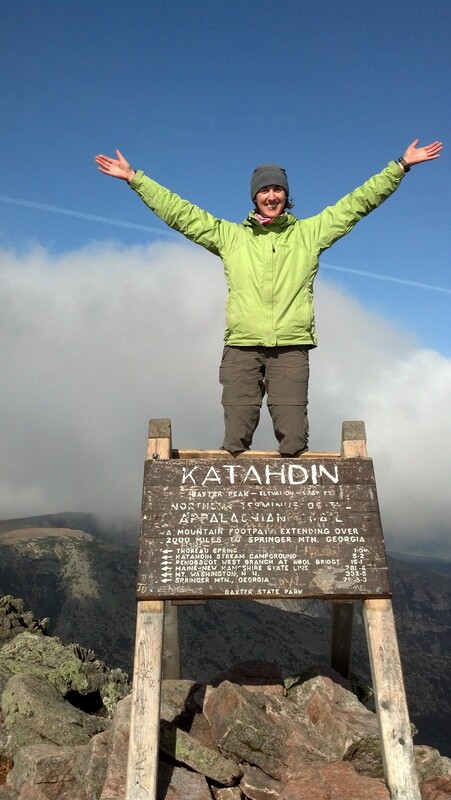 Some friends up there starting cheering for me as I walked the final steps up and touched the Katahdin sign. It didn’t seem particularly momentous. I was glad to reach the top because it was a hard climb and I wanted to sit down and eat, but it didn’t feel like the end of a seven month long journey. Of course it wasn’t quite the end because I still needed to go back 5.1 miles down the gnarly, steep mountain, and going down is harder for me than up. 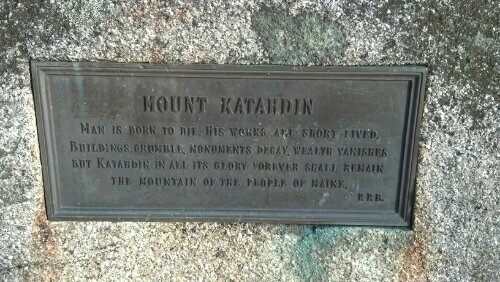 It had taken me 3.5 hours to get up the mountain, and I spent 1.5 hours on top. More hikers showed up and we cheered for each of them. At one point, there were seventeen thru hikers on top of the mountain, and I know others made it up there before and after us that day too. The park is only open for day use after today so the 15th is the last day people can easily summit and get out of the park. The clouds were moving in and out while I was on the summit too, so I got separate summit photos in clouds and in sun. We eventually started back down the mountain to make it out before dark. The sun was out for good by then so I had excellent views the whole way down and could take my time a bit more. It took me four hours and I finally felt done when I reached the parking lot. Once everyone made it down, we piled into the three cars and headed to Millinocket. We had reservations at the Katahdin Inn there since it had a hot tub. I walked across the parking lot to McDonald’s with some people so I could get a quick dinner and more quickly get to the hot tub. After eating, showering, and starting laundry, four of us made it into the tub. Most people had fallen asleep by then. It really helped out everyone’s sore muscles. Then we all hit the sack after a very long day. I KNEW YOU COULD DO IT!!! CONGRATULATIONS KRISTEN!!! Congratulations Kristin and welcome home. Congratulations! I may not check my email for a month. I have eagerly await every one of your blog entries and enjoyed all of them. Great pictures! REALLY proud of you. Nice job. Congrats Kris – very happy for you! I really enjoyed following your blog. Congrats!!!! You are amazing. Thank you for sharing your journey with me via your blog. What an accomplishment! Congratulations Kristen! Can’t wait to catch up with you and Greg again soon. Congratulations! What a fantastic journey. I wish I could have joined you for part of it (but work got in the way). Super exciting Kristin!!!!!!! We missed you! Way to go, Siren! What an awesome journey! We enjoyed being a stop along the way and hearing about your adventures each day. I’m not gonna lie…I will miss the daily excitement of getting my blog update in my email. Congrats Kris! What an amazing accomplishment! Congrats! 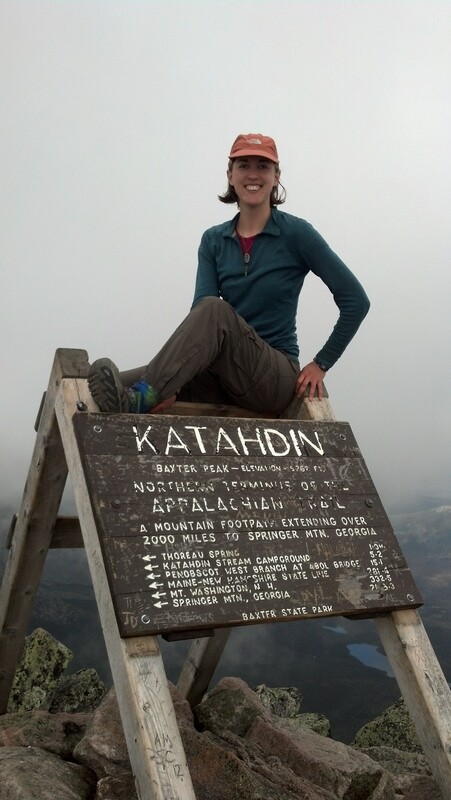 Your big smile on top of the Katahdin sign says it all! I will miss following your bog – nicely written and understated, but a real nail-biter at the end! I know what a big accomplishment this is! Congratulations on an amazing journey! So glad to have you home again! Congratulations! Thank you for sharing this journey. I am so happy for you! Congrats!!!! I have been following your blog sporadically this summer as we had available Internet and I was really routing for you! You overcame some big challenges and you should be very proud! Hope your post-trail life transitions well! Love you Kris!!!!!!! So proud!